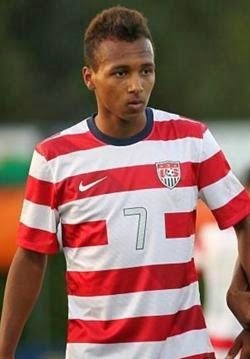 The latest coup for the US National Team in the German Connection is Julian Green. The highly-regarded Bayern Munich player has been a target of Klinsmann and US Soccer since last fall when he burst onto the scene scoring 15 goals in 19 games for Bayern Munich II and playing for Germany in the youth levels. Green made an appearance in the dying minutes of a UEFA Champions League match versus CSKA Moscow November 2013. And although he has yet to play again for the German giants, it is clear that he will soon a given his exploits. What's the real significane of Green's choice to represent the United States? He won't be another Giuseppe Rossi or Neven Subotic. He won't grace another country's jersey, just America's. And if he's a breakout player he will be America's breakout player. It's true that we don't know his true worth yet but Klinsmann is pretty clear about the youngster's talent. The thought of an unproven player at the World Cup might seem hard to swallow for some but let's remember that Bruce Arena was close to bringing Rossi to 2006. Klinsmann has excelled in repatriating and plain capturing players with dual nationality for US Soccer. Aron Johannsson, Fabian Johnson, Mix Diskerud and Joe Corona are all integral players for the team. Julian Green can add to that. We are frankly all very excited about this turn of events. And we won't need to wait that long to see him in a US jersey. If his paperwork goes through, young Green will be available to play versus Mexico in April.